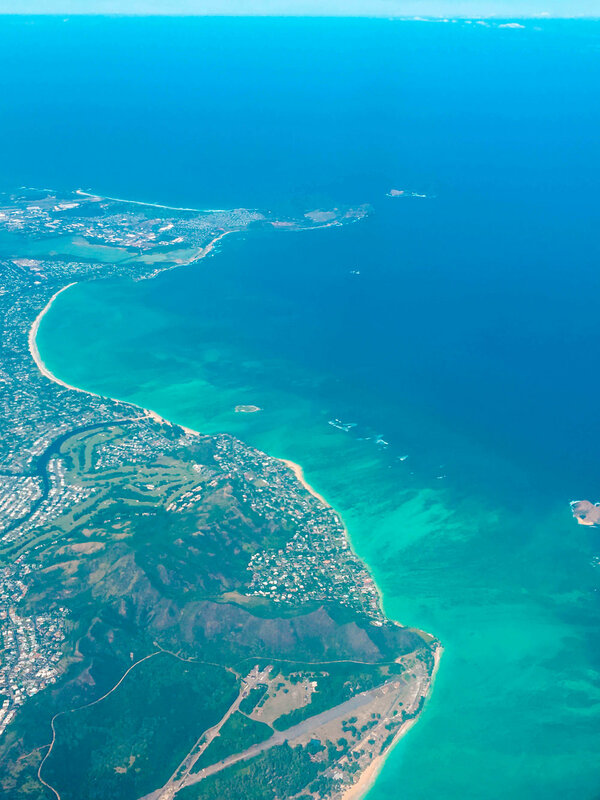 Oahu is the island you are probably most likely to visit during your Hawaii vacation as it is the home of Honolulu and thus Waikiki airport. Living in San Francisco we already had the perfect start for a Hawaii vacation as you're basically as close as you can get anyways. However, a flight to Oahu can be enjoyed best when you bring your personal cocktail mixer. The view will be even prettier if you can drink an ice cold passion fruit cocktail - that is, if you get it through TSA but since we did it, you can do it, too (they must have thought we're a bit crazy though and needed to take an actual example to check what it was but in the end they really did let us pass)! Even though my favorite part of Oahu is the North Shore, I would definitely recommend to stay in Honolulu for some time, too. 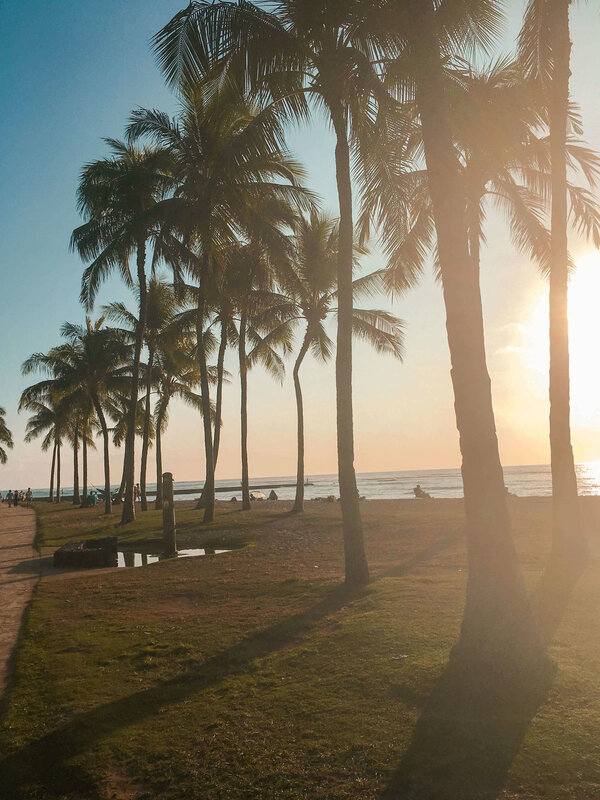 Yes, it is more touristy but you kind of have the best of both worlds - a big city with lots of restaurants and sights and a beach right in front of your door. And I literally mean right in front of your door. Our hotel was right by Waikiki Beach and it was the perfect start into our Hawaii vacation with this great view. With such an amazing beach right in front of your hotel you can't really say no to a nice and relaxed day at the beach. And even though Waikiki Beach might be a bit more crowded it still blows my mind that you can have such a great beach right in such a big city. You should definitely stay out for a truly amazing Hawaiian sunset while you're there, too. We walked towards the end of Waikiki Beach and found an amazing spot where we did not only have a great view of the sunset itself but also Honolulu. Our exquisite Hawaiian diet included coconuts, shaved ice and of course - acaii bowls. In my humble opinion, you can find the best acaii bowls in the world on literally every corner - and huge ones too! We actually fell so in love with the bowls that we have been trying to make them at home for breakfast, too. I am a huge fan of shaved ice too, though as in my head it is the ideal candy, as it's just ice with some syrup and it looks soooooo colorful)! After our stay in Waikiki we moved to the North Shore - as we've heard that that was where the cool kids hang ;) We were staying at Turtle Bay Resort and I absolutely loved the place! If the resort looks familiar - you might have seen it in the movies Forgetting Sarah Marshall (a good one, trust me) or the Baywatch reunion. Besides, their mascot is the "Humu" - a Hawaiian fish with the wonderful name of Humuhumunukunukuāpuaʻa (credits if you can say it and even more credits if you know the High School Musical song that I used to sing every morning after we woke up haha). If you are still not convinced - look at this amazing view from out hotel room. The hotel also offered amazing breakfast so my German breakfast heart was happy as it can be. During our stay on Oahu we also had our biggest Hawaii adventure, which I will tell you about in a future post: we went shark swimming (no cage)! After not being eaten by a shark we could explore the North Shore beaches a bit more, which definitely is amazing! Even though Oahu might be the most crowded one, you can still find the most beautiful abandoned beaches! We definitely made a lot out of our Hawaii vacation as we visited two different islands, explored different areas on both and had a once in a lifetime adventure with the sharks. That is why this will definitely not be the last article about Hawaii on Kate Rebel. However, I would also love to go back and see different islands and explore even more of the beautiful state. A hui hou Hawaii, it's been a pleasure! I hope you enjoyed my travel diary from our stay on Oahu. Have you been in Hawaii too? What are your favorite spots on Oahu? Kate recommends: A stay on Oahu goes very well with a copy of Kauai Hart Hemmings' "The Descendants" (you might know the movie). The main character Matt King - of Hawaiian origin - has to deal with his two out-of-control daughters after his wife fell into a coma. The family drama is contradicting to Hawaii's idyllic backdrop but well - I'm sure you know the story already (or at least George Clooney).